Situated on the River Tweed, Fairnilee is a stretch of grade 2 rapids suitable for division 2, 3 & 4 events. The course varies greatly with water level, from a scrape in summer to a washed out wave train after spring or autumn rain, but it does provide challenges at all levels. In terms of difficulty, the course sits midway between Alva and Grandtully, so is a good place for the improving paddler to try out their white water skills before moving on to harder courses. The course normally begins above the bridge, where the river is wide and shallow, testing paddlers' current crossing skills. The water then channels mainly through the left-most bridge arch, with a small eddy just below the bridge on river left often holding a gate. The river flattens out slightly before reaching the 'horseshoe drop' which is the most technically difficult part of the course (pictured). At low levels, the normal route is to the left of the central rock, although it is possible to find a route down the right. At high water this washes out into a large V-shaped wave. This part of the course is directly in front of the car park, so expect plenty of onlookers. Another wide section follows, before the river finally narrows again into the aptly named 'bottom rapid' which has a remarkably quick jet of water between several sharp eddies, causing eddy lines which have been known to trip up paddlers very close to the finish line! In May Fairnilee hosts the River Tweed festival, which involves a 2.5 mile river race, followed by a mini slalom on the flat pool above the main slalom site, and a sprint race down the rapids. To get to Fairnilee, follow the A707 between Selkirk and Peebles. 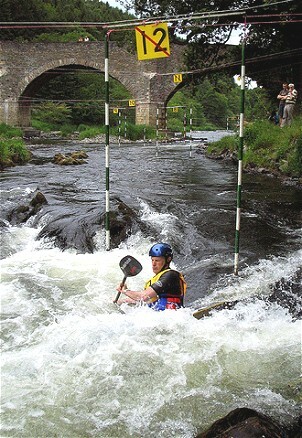 The course is situated at the Yair bridge crossing the Tweed, 4 miles outside Selkirk.